We are currently going through a heatwave and I need to give our plants a good drink every day. 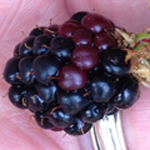 One of the joys of this task though is regularly finding another blackberry fruit that has reached full ripeness and which is promptly consumed, imparting that delicious blackberry flavour. Incomparable! However the fruit in this photo is nearly there and I thought it worth sharing as another example of how wonderful nature is. Notice how the fruit is actually made up of separate segments, like globules, and these all have their own life cycle, ripening at their own pace, but all combining together to make up the complete fruit. If I was to eat this particular fruit I would get a mixture of sweet and very tart tastes as I sensed the ripe and the ripening segments. This example then made me think how like our body this plant is. All the vines, the roots, the leaves, the stems, the fruit itself, all individual components living their own life cycle but in harmony with each other to make up the whole entity we see as a blackberry bush. As do all the bones, organs, arteries, veins, muscles, tendons, nerves of our body perform all their individual functions and to their own rules but work in harmony with each other. How far out could we take this component/wholeness concept? Our body is part of a family, part of a community, part of a country, part of the world, part of the universe. Shouldn’t harmony be the natural goal? And maybe this fruit will be ready tomorrow.